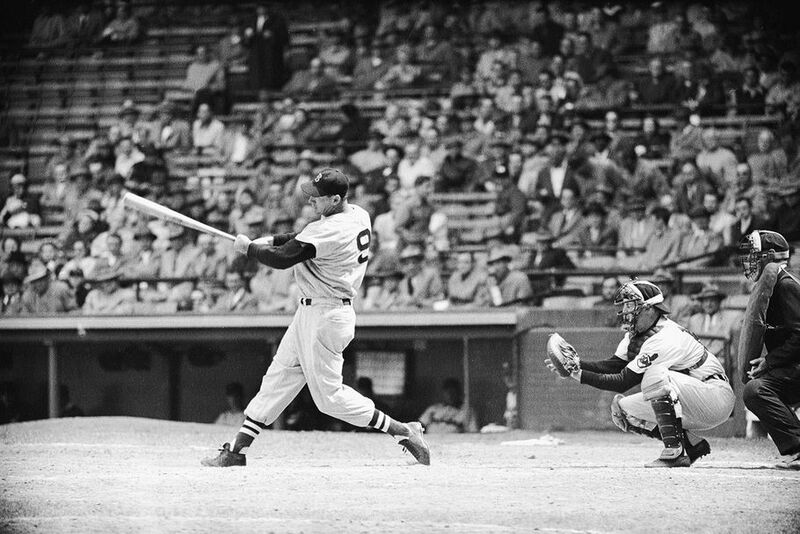 To baseball fans, Ted Williams was a true icon, the sport’s Peter Pan – the ‘Kid’ who combined preternatural gifts with a fierce work ethic to fulfill his lifelong dream of becoming the greatest hitter who ever lived. Along the way he became known not only for his batting prowess but also his single minded pursuit of excellence, which caused him to battle equally with Boston sportswriters, fans (on whom he was known to spit), and even his own Red Sox teammates, who complained privately (and probably unfairly) that the Splendid Splinter was a selfish player more interested in personal goals than the team’s success. But Ted Williams was far more than the cardboard cutout legend that fans know, and certainly more than the tabloid headlines that greeted the bizarre cryogenics episode that followed his death. He was as painfully human as any of us, driven by shame over his background, humiliation over his father’s weak nature, and a deep conflicted rage over his mother’s virtual abandonment of him and his siblings, as she seemed to prefer her work at the Salvation Army in his hometown of San Diego to taking care of her own family. For years, in fact, Williams kept his Mexican heritage hidden from the public, in part, as he said later, because he was worried how prejudice would affect his career, but also, it seems, because he was worried it would draw more attention to his Mexican-born mother. In rage and retaliation, he poured all of his energy into becoming the best, and in time he may well have mastered not just the hardest feat in professional athletic – hitting a baseball – but two other complicated physical feats as well: fly-fishing, and combat flying. His 39 and 0 War record as a pilot may have been even more astounding than his .406 batting average in 1941 – and to those who went fishing with him, he wasn’t just a Master, he was a certifiable Genius. His heroism and courage remain undeniable. For all of his flaws, about which he was refreshingly candid– Ted Williams was throughout his life as guileless as they come – his attributes of personal fortitude, relentless pursuit of perfection, and courage remain remarkable. And the highlights of his baseball career are undeniable: the astonishing rookie season of 1939 when he still played with an unadorned joy not yet spoiled by his complicated relationship with the city of Boston… the game-winning home run in the 1941 All Star game… the last day of the 1941 season, when he famously decided to play in thefinal doubleheader though manager Joe Cronin had offered to bench him to preserve the iconic .400 average… his one World Series of 1946, when injury prevented him from playing at full strength, though he never used that as an excuse for his paltry play… the two tours of military duty, when he lost more than four seasons and countless home runs to serve his country… the back-to-back batting titles (his fifth and sixth) he won at the age of 39 and 40, long after old rivals like Joe DiMaggio had hung up their spikes… and of course the final of his 521 home runs, when in his final at bat he rifled a shot into the Red Sox bullpen and then circled the bases with his head down, touched home plate, and went into the dugout without once acknowledging the adoring Fenway Park crowd which beseeched him, just this once, to tip his cap to them-- proud and uncompromising, to the very end. Now, American Masters brings the immortal Ted, the thinking man’s hitter, an Artist with the bat, back to life. We’ll tell the story of the man himself, his demons and rages, the complicated relationships with his family, the Boston press, the fans, and maybe the most complicated relationship of all: the one he had with himself. For if Ted Williams is an American icon, a man whose Western implacability, stalwart strength, and carefree grin were as associated with American masculinity as John Wayne – it’s because Williams, to the end, was his own man.A proud symbol of our Greatest Generation – a man who did things his own way, without complaint and without apology. Perhaps only in retirement was he able to mellow and enjoy what he had accomplished on the ball fields – but for his personal life, it may have been too little too late…. The film will contain extensive in-depth interviews with those who knew him best and can speak about his impact and legacy – on baseball, America itself, and the concept of heroism. We’ll produce two different kinds of tasteful recreations: first,shot through with diffuse light in a kind of mock heroic style, to demonstrate the power of the heroic myth-making culture in which Williams flourished; and second, more documentary and gritty, to demonstrate what may have been behind that myth. This tension, between the mythic and the real, will run throughout our film and will permit us to paint a fuller portrait of the essential man, and the nature of real heroism. All will point at our fundamental goal: to peel back the myth to get at the essential humanity of the man himself. In so doing, we’ll suggest what drove Ted Williams to such heights, and why the concept of the quiet hero is still so powerful today.